An exoplanet is a trillion miles from its star. Astronomers have discovered that a huge planet and star 104 light years from Earth form the largest solar system ever seen. The planet, dubbed 2MASS J2126-8140, and its red dwarf star are a full 7,000 astronomical units (AUs) apart, or a trillion miles (an AU is the distance between the Earth and the sun). Researchers previously thought the planet was "rogue," roaming the galaxy alone. In fact, they're so distant that if the star exploded, citizens of planet 2MASS wouldn't know about it for a full 62 days. Given its bizarre characteristics, however, it's unlikely that anyone lives there. For one, it's up to 15 times the mass of Jupiter, the largest planet in our own solar system. You might think that makes it a frigid gas giant, but that's not so. 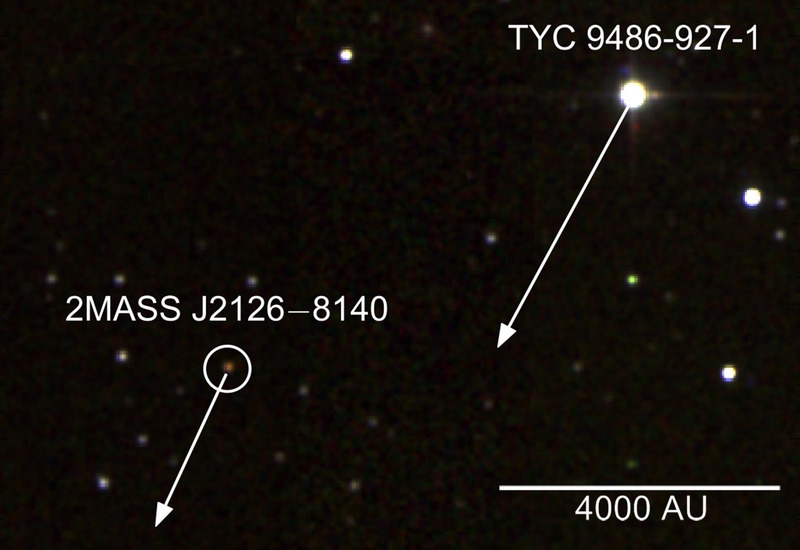 2MASS is so large that it's on the border between a planet and brown dwarf star, and has a likely surface temperature of around 2,730 degrees F. Meanwhile, the star it orbits around, TYC 9486-927-1, is very young, with an age between 10 and 45 million years. Given that 2MASS takes 900,000 years to do one orbit, it has only made a maximum of 50 trips around the star so far, total. By comparison, a well-known planet of similar size orbiting the star Beta Pictoris b star is much closer. "Compared to Beta Pictoris b, 2MASS J2126 is more than 700 times further away from its host star," said co-author Simon Murphy of the Australian National University, "but how such a wide planetary system forms and survives remains an open question."